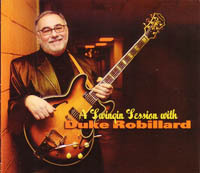 A Swingin' Session with Duke Robillard and special guests Scott Hamilton, Bruce Katz, Doug James & Carl Querfurth. "There are classics like "Deed I Do," "The Song is Ended," "Them That Got" and "When Your Lover Has Gone." Rhode Islanders Scott Hamilton, Al Basile and Doug James, along with half a dozen musicians who have played (or still play) with Robillard, help power bluesy fare such as "They Raided the Joint" and" Swingin' with Lucy Mae." Bruce Katz' organ playing is superb throughout, and horn contributions from Carl Querforth (of Roomful) and Gordon "Sax" Beadle are pushed along by a rhythm section that effortlessly lifts the band." We can take advance orders for the new CD - It will ship on the 14th for anyone purchasing it in advance.